Let's have a comment here perhaps. — From either him, or yourself. Another Cliff Mass article on the topic. Just for a laugh. Let's face it this subject gets way too serious or contentious. "Former Vice President Al Gore wasted no time tweeting out ThinkProgress’ in-depth article, trying to link higher carbon dioxide levels to lower cognition in humans." No one is pointing out too strongly that the study has to do with indoor environments. That said, I worked with a chemical lab not 20 feet from my office. By now I should be drooling on my hard drive. If anything, I'm better and stronger minded than I was 20 yrs ago. So Al, ........bite me !! I've been lurking on this Thread, but never have I posted. I read an interesting article that NASA wrote yesterday regarding Mass Gains of Antarctic Sea Ice that outweigh losses of melting glaciers. It's interesting to see that a "warming" planet can cause more Ice to build? Also, Arctic Sea Ice content is growing at 10 year highs this year even during a Strong El Nino! Pretty incredible. Even the Greenland Ice cap has been tacking on billions of tons of ice/snow above the norm. The two go hand in hand,(Hadley Cell growth/global warming) in many respects. It's a complex problem rooted in differential heating, and there are a slew of chickens and eggs involved because there's no way to isolate the important signals due to their overlapping frequencies. For example, using the data we have on the global radiative budget, the observed changes in the macroscale global circulation(s), alone, argues for a planetary-scale warming that is most anomalous towards the polar regions, and less anomalous in the tropical regions (which is what we have observed). However, this distribution is exactly what would favor these circulatory changes in the first place. So, obviously there's a negative feedback in there somewhere, and the underlying causative mechanisms are probably low frequency forcing(s) that stem from, influence, and/or serve as an intermediary through the tropical domain. This implicates a number of potential forcings on varying timescales, including anthropogenic-radiative forcing on dynamics in the upper troposphere, and numerous solar-radiative and geomagnetic forcings on dynamics/chemistry, (and subsequent wind-flow and circulation) in the troposphere, stratosphere, and mesosphere. So it's likely a combination of factors. Due to the fact that we understand so little about the aforementioned, and the general lack of computational power required to investigate the climate system more thoroughly, it's tough to make definitive statements without obvious naïveté. That said, we have made major progress, and a number of fantastic papers are due to be published over the next 5-8 months. We have uncovered strong relationships between ENSO/PDO and Solar/QBO harmonics using a systematic inertial intermediary. We've discovered fascinating linkages between stratospheric dynamics and tropical convection that operate on multiple pathways, on numerous timescales. We've even uncovered potential long term linkages between the strength of the planetary magnetic field and microphysical processes in clouds as well as large scale temperature gradients/thermal winds in the upper atmosphere. This is only just the beginning. There's so much still yet to be uncovered, so it's best to keep an open mind to everything out there. Right. Someone needs to tell the ol' poop just how much it takes to fuel his eco-friendly car with electricity!! If he wants to save the environment, he should have contributed more to society by working, and not waving and smiling. Yes, Sweden, land of a slightly smellier royal family. Okay, a little climate change gone Sideways. All the liberals here lighten up and don't take it personally. If it had attacked Independents or Reublicans, I'd still post it. Bozos, minimalizing important issues, even probably too. Huh. ? Yeah, life's too short to get all worked up in to a lather. A hundred years from now, it'll be the Conservatives on a Global Warming rant. Stick around long enough and everything returns with a twist. I've decided to sit back and try to enjoy the show......and yes, that's dark humor. It's been bothering me a bit to see how our Global leaders are handling much more important issues than the idea of Global Warming, which, BTW, still to this day have not yet been proven. You know what the #1 problem is with our country and other global leaders??? When you have leaders around the world discussing Global Warming in the NATO meeting in Paris about a week ago saying that Global Warming is our #1 problem. Meanwhile, countries around the globe are falling apart due ISIS bs. Righhtttt.....we need to change our Priorities asap. Better yet, Democratic runner Bernie Sanders says Climate Change is directly related to the Growth of Terrorism. Are you freakin' kidding me? You gotta be so brain washed and walking Sheep to believe that statement. Fix the school system, educate, grow our economy through innovation and that is how you fix the problem instead of pushing Global Warming myths. Tell me I'm wrong. It all boils down to "Prudence" of course. — As in, at very least, adopting a "prudent course", in line with the (even if "not" "appreciated" as "over-whelming" / more general.) "preponderance" of "evidence" pointing to the idea that the planet is warming; .. "both" (?) more "naturally", and .. more "anthropologically". So, right Tom and Richard. I would like to add we need to stop caudling our kids, Handing them all trophies and pizza. We're too soft to compete as we should. Remember your childhood? Our current leadership is hopeless. Look who is running for President for heaven's sake? Both sides. My Kingdom for a Statesman ! For me it boils down to this. None of them have the faintest freakin idea how to solve what has become an insurmountable complex problem. Where we go from here is Scaryville. As Han Solo said, "I have a bad feeling about this." It's more than the GW myths, its the sheer fact that they are either lost in their own cloud of political fog, or somehow someone owns them. Bottom line, corruption and stupidity and nowhere to run. Right. So everything is nothing, and nothing all reminiscent of how it could be but isn't: .. give 'em hell "a Statesman". ...... Maybe "grow", something. / Move a few feet more "back" from the TV. Troposphere temps. These should spike as Nino convection increases. Or maybe not be so snarky to your forum pals, eh? I hadn't read any thing like that above. Just a lot of fairly "faint" thinking, leading away from the idea of taking a more prudent course where regarding our "changing" climate; demanding some both thinking along with "action/s", much more and better, rounded. — Boiling down to, ... some fairly empty rhetoric, pointing to "not much", more substantive. Characterize, this here more just above, any way you like. Just ignore the thousands of peer-reviewed articles regarding climate change and post this piece of garbage. A lot of people on this board really need to educate themselves better on climate change. The radiative forcing of CO2 can be calculated mathematically and you cannot in any way argue that greenhouse gases lead to a cooling trend. You really think I can show this article to a professor in my Meteorology program and not get laughed out of the building? Whoever wrote that article is conflating upper atmospheric radiative processes w/ lower atmospheric radiative processes. Yes, CO^2/NO cool the upper atmosphere via collisions with N^2/O^2 under the lower density environment (molecular kinetic energy transferred from O^2/N^2 to CO^2/NO upon collision which is re-emitted at a rate higher than the collisional rate due to the greater DOFs at that altitude). In the lower atmosphere, the increased pressures/reduced DOFs render the opposite true, where CO^2 intercepts radiation within its absorptive spectrum and conducts it to surrounding N^2/O^2 at a rate greater than its emission frequency, so the net effect is one of warming. Contrary to popular belief, it's not the "backradiation" that does the warming, it's conduction. There are a slew of potential problems with AGW theory, but this isn't one of them. March was now the 11th straight warmest month on record. Interesting article on Greenland glacier ice melt and the sea floor. I wanted to post this link to a site (Global Weather Oscillations)...credit Niko for posting from our Great Lakes forum. It that was created by a former NOAA meteorologist (David Dilley), who has developed a cyclical theory which is patent pending (Climate Pulse Technology). He exposes the bureaucracy how the European and U.S. gov't's sensor or purposely denounce anyone who studies cyclical patterns of climate/weather. They will not allow grant money to those who would like to research climate cycles. Instead, they provide "hand outs" to those who can prove man-made induced Global Warming. Now, isn't that a little suspicious??? Only the private sector studies climate cycles, etc, which, in my opinion, is on the right side of this argument and stands a better chance of finding out the truth. Follow the money and you will know the Truth. What is a "climate change doubter"? Stupid headline, considering no skeptics I know rely on Antarctic sea ice extent to solidify their skepticism of alarmist predictions. Aside from the politically driven headline, it was a good article. Headlines sell newspapers. The article's conclusion may be good news, yes? Selling a newspaper shouldn't require turning the headline into an irrelevant and misrepresentative turd. As for the conclusion(s) and actual material, yes, I'd agree. From a former NOAA met, Mr. David Dilley, he explains how the natural global warming cycle which peaked in 2013, has reversed course and the onset of Global Cooling has begun. Here is a short explanation of his thinking. The global climate pattern is now transitioning from a global warming cycle (2000 through 2013) to a global cooling long-term cycle. Both the Arctic and Antarctic entered the next global cooling cycle 3 years ago and have been dramatically cooling since 2013. Although due to the El Niño, sea ice in the western Arctic near Alaska and Euro-Straights region near Iceland has diminished during late 2015 into 2016, but it will once again begin freezing more solid and grow during late 2016 and 2017, diminish some in 2018 and then grow tremendously thereafter. The sea ice extent is at the greatest values in Antarctic since the 1970s, and was likewise at its greatest extent in the Arctic prior to the 2015-16 El Nino. The Artic is already cooling rapidly following the ending of the El Nino and will once again see great ice restoration - and thus much colder winters across the Northern Hemisphere. In addition; the sun has entered a cooler phase - hence conditions much like the period from the 1940 through the 1970s will alter the warm temperatures experienced during the past 12 years. For example; aside from this year's El Niño, the northern areas of the United States and Europe has experienced much cooler weather during the prior two winters (2014 and 2015) and much colder than the winter temperatures observed from 2000 through 2013. Thus the transitioning to a colder climate period must be taken into account. As discussed in Mr. Dilley's eBook (Earth's Natural Climate Pulse) that can be read free of charge in the Climate Section, the period from about 1997 through 2012 was the second twin peak of warm global temperatures (1930s was the first). Twin warm temperature peaks are a signature of all global warming cycles (5 in the past 1,000 years). The cold winters in some regions of the world and the cooling now taking place in both the Arctic and Antarctic signals the ending of the current global warming cycle. Every global warming cycle comes like clockwork about every 216 years, and also ends like clockwork. 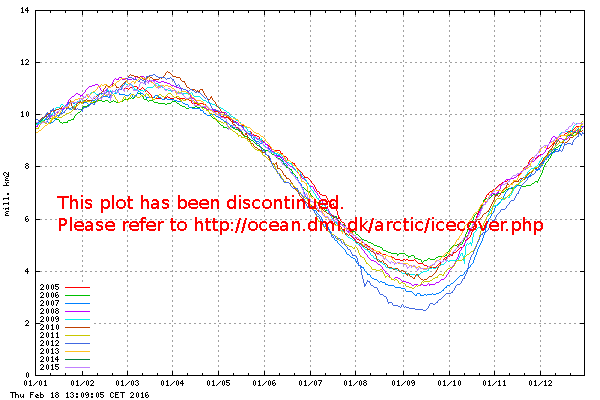 Rapid cooling of the high Arctic in 2013 and 2014 denotes the ending of the global warming cycle. Next cycle will be in about 120 years. Global cooling has begun? Mmmm let me go back and look at the climate records since 2013. Let me guess though, those are all made up. All the airports and other sensor locations are all part of the ruse here and are in it together with the politicians that doing this for economic gain? The human race is relatively insignificant. The planet could exterminate us very, very easily. You could fit all of those 7 billion people, standing side by side, into the state of Maine (probably with room to spare). Spatially, the vast majority of this planet (over 95%) remains uninhabited. As for CO^2 increase, despite our burning through ~ 30% of the world's oil reserves, we've increased CO^2 by less that 100 *parts per million*. Out of one million molecules, only four hundred are CO^2. That's actually very low, geologically speaking. We're just a bunch of pansies. Out of one million molecules, only four hundred are CO^2. That's actually very low, geologically speaking. Convince the "nincompoops" that write the legislation of this fact. It's like speaking a dead language to them. And forget common sense. That was thrown out the Capitol building windows long ago. And yes indeed, I'd have to say 99.99% of the human race is seriously "pansied". When I think of how I was raised and what I've done in my lifetime, then compare that to the weenies I know today, I weep for civilization. You are forgetting about the solar aspect. That is one variable we have yet to see if it will cause cooling. A lot of people think the extreme minimum coming up will have a strong cooling effect. You also have the fact there is normally a strong backlash after very strong El Ninos. The mid 1980s were very cold after the 1982 super Nino and there was also a sharp drop after the 1997-98 Nino. In short I would bet a decent sum you are wrong. I'm not forgetting about the solar aspect, I just don't it's going to have much of an impact on global temps. The next solar minimum will be a small, short term blip down in a climate that has been, and will continue to steadily warm over the long term. And globally, the mid 80s weren't cold at all compared to what we saw pre-1980. Considering global temps have risen significantly since 2011, I think it's safe to say there's no danger whatsoever of an impending ice age. I doubt we even get back to pre-2014 level global temps in our lifetimes, barring a Pinatubo (or bigger) type eruption or a brief excursion below that level with a very strong Nina. There hasn't been any trend in lower tropospheric temperatures since 2001, so I'm not sure what you're talking about here. I think that's pretty silly. Regardless of the next century's trend, it's not going to be a runaway process and we'll see some peaks and valleys and ENSO of course plays a big part in that. We will certainly see another major La Nina event in the future that will significantly cool things for a year or two. It's easy to forget that the 20th century warming saw a complete halt and in some multi-year instances a reversal of course between 1950 and 1980. It's likely that that same scenario will play out again to some extent at some point during the 21st century. It wouldn't take much to get to 2012 level temperatures again in our lifetimes. I totally agree. This reminds of the stuff people were saying about there being no Arctic sea ice in the summer by 2012 after the very low ice pack in 2007. The one that really kills me though is some poeple seriously believe there will be a 7C warming by the end of this century. Totally insane. The point was there is usually a strong reversal of global temps after a very strong Nino. That alone should easily cool the globe to pre 2014 levels for a while at least. The mid 1980s were pretty cold.